For years I was fascinated by the idea of adding lights to my costumes and props, but at the same time really scared of trying it myself. Having nearly failed all of my physics and math lessons in school, I immediately felt a cold shiver down my spine just thinking of all of these confusing formulas. Since you are reading this text, I bet you feel similar. Let me tell you the good news: It’s not as complicated as is looks. Just start simple! It glows! That was easy, wasn’t it? As you can see, all you need is a power source (battery) and a LED. I used a simple 2032 button cell battery, which provides exactly 3 volt. This is exactly how much this tiny light wants. You don’t need any calculations, any soldering and don’t have to think about which materials and tools you might have to get. If you want, you can just wrap some tape around, squish it into your costume and you are good to go! Yes, this actually works with all colors, even if other LEDs require less power. I did this for years and it worked perfectly! Oh, and if you are wondering: This setup lasts for around 12 hours. Afterwards just get a new battery. Curios? There is more! Here are a few examples to make you even more excited! 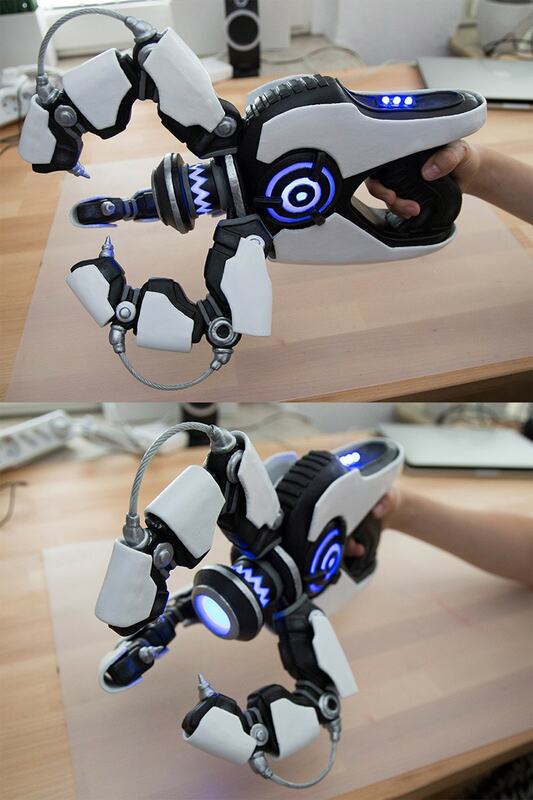 Here is built Symmetra’s Photon Projector from Overwatch. And here my Druid Tier 8 armor from World of Warcraft. All you need is a battery and and LED to light up your costumes. Wires, switches, battery holders and everything else is just optional. Don’t be scared of maths and just try things out! The next step is to hold everything together properly with wires, add a switch to turn your lights on and off and add a battery holder to change your battery more easily. But all of this is optional. With a little bit of luck, someone in your family already has a soldering iron and after some research, you’ll find out that all the tools and materials are actually extremely cheap. A new soldering iron costs only only 20$ and wires, LEDs, switches and battery holders are available on ebay for only a few cents. 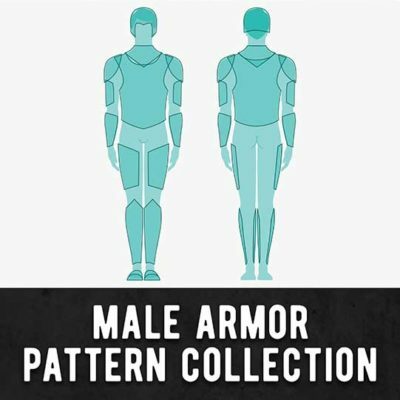 If you want a more visual example, here is a little video I did where I explain it all! 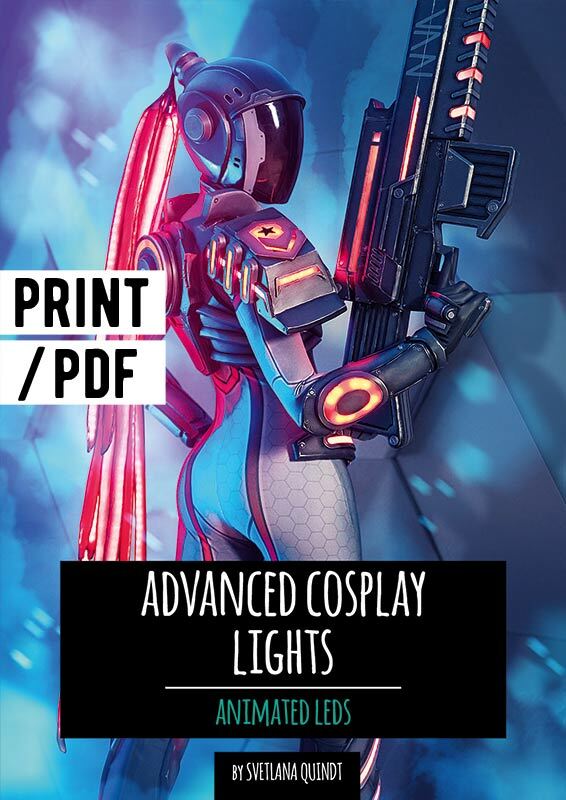 Check out my Book of Cosplay Lights – Getting Started with LEDs. I wrote it for someone who has no idea about LEDs at all, just as I did a few years ago. It’s really easy to understand. And the best: No math is required! … or my Zinogre armor from Monster Hunter. While these LEDs installations are a little bit more complicated, they are still totally doable even for beginners who’ve never soldered before. I personally really enjoy learning new things and really loved how helpful all the tutorials on www.adafruit.com were. 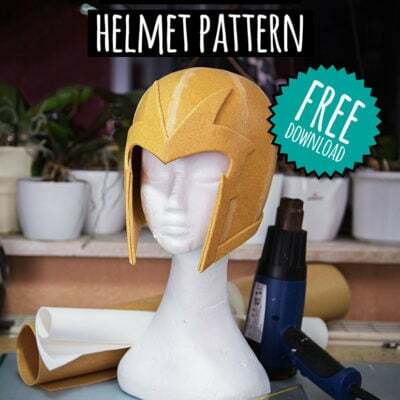 So, if you’re curious, I did a video tutorial about this topic as well! 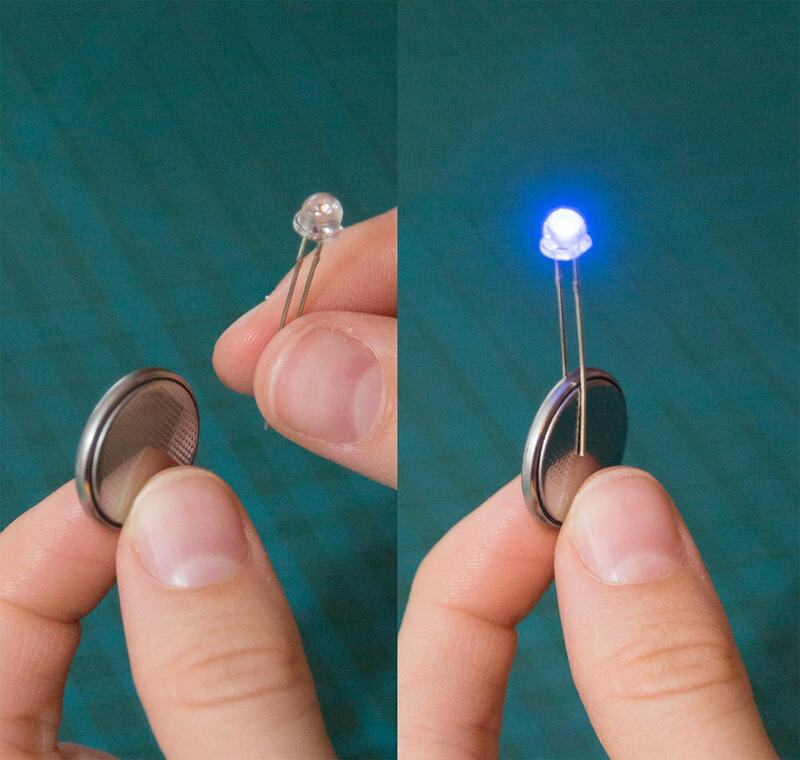 I also wrote a handy guide on this topic as well: Advanced Cosplay Lights – Animated LEDs. It’s called advanced, but it really isn’t. Even if you have no idea about programming you can still get amazing results with moving lights. You just need to know how. I kept this book very basic and easy to follow. You don’t need to be an engineer to look like a sparkling x-mas tree! As you can see, LEDs don’t need to be scary! Yes, it took me a few years until I finally got out of my comfort zone and dared to buy a soldering iron, but I noticed very quickly that I didn’t had to worry at all. Learning electronics is really easy with the right source and super fun! Plus you will be incredibly proud once you turn on your lights for the first time. I promise you!